Millions of the world's children live on the edge--of life, of society, of having their interests taken seriously. Life follows one man, Mayor Amilcar Huancahuari, who's trying to change that, and wants to put children at the center of how we build our future. Early Life first filmed with the Mayor when he was running a poverty-stricken suburb of the Andean city of Ayacucho, Peru. Now he's running the whole province of Huamanga -- and has the chance to spread his optimistic philosophy. 1. In the Mayor's Footsteps - Peru - Mayor Amilcar Huancahuari is trying to convert his native Peru to his optimistic philosophy of promoting early childhood development. 2. In the Mayor's Footsteps - Brazil - Mayor Amilcar Huancahuari visits Brazil to assess efforts to promote early childhood development there. "Both of these videos highlight the universal challenges that many children encounter--poverty, violence and economic hardships. Mayor Amilcar Huancahuari is a gracious travel guide who asks important questions, listens carefully and is a constant advocate for young children and the value of an early start. This is an excellent way to bring the global issues of human rights--especially as they relate to children--to the forefront. These films are an excellent way to start essential conversations about how all of us are providing a safe and nurturing foundation for our youngest citizens." "These powerful films focus on the all too often ignored fact that growing up in poverty, with the high levels of domestic and community violence that often accompany it, can profoundly impact early development. Inspirational Mayor Amilcar Huancahuari of Peru takes us on a heartfelt journey looking at how violence affects young children in his country. Then, he explores groundbreaking programs designed to counteract the harm caused by the violence in the lives of poor children in Brazil that he hopes to bring back to Peru. Anyone who sees these deeply moving films will be more highly motivated and better equipped to promote political, economic and social justice for children, in their own communities and around the world." "Promoting Mayor Huancahuari's plans for a future where children have the opportunity to fulfill their highest potential, both DVDs are uplifting and very highly recommended, especially for public and school library DVD collections." 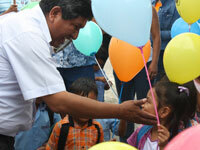 "Mayor Amilcar Huancahurai is a refreshingly unique figure, a politician who puts children first. Director Steve Bradshaw has created an upbeat film documenting the Mayor's quest to end the cycle of violence, and to create safe, loving, and nurturing environments for children. The DVD would support courses in family studies, policy studies, social work, and education. The documentary should be viewed by those with an interest in the provision of social services to children and families, and it is particularly recommended viewing for those who are concerned about the intersection of child development and public policy."